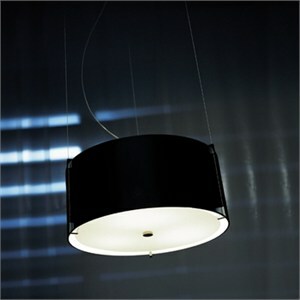 Suspended lamp for diffused lighting. Chrome or brushed nickel-plated metallic structure. Satin opal blown glass diffuser. Satin white opal upper and lower acrylic diffusers. Three support wires for stabilization. Note: Opal white glass models are special order items with longer lead times. Uses 3 X 60W max medium base incandescent bulbs. Design: Christian Ploderer. Italy.